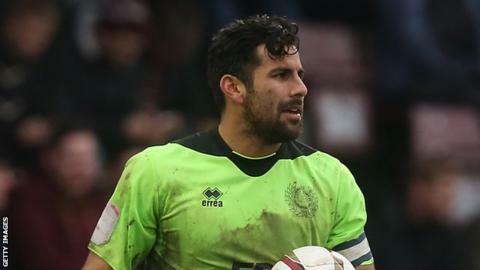 Aldershot Town goalkeeper Jamie Young hopes the club can replicate the form they showed in their FA Cup run in League Two. The Shots, who are one point above the relegation zone, were beaten 2-1 by Middlesbrough in the fourth round. The 27-year-old told BBC Surrey: "We are a good team and know what we can do if we keep believing. "We have got to put out performances with that intensity and togetherness. It's up to us how far we can go." He added: "We have been through highs and lows as a team and it is now important we use this as a springboard. "We can raise the bar if we need to and we will need to do that for the rest of the season." Aldershot came close to forcing a replay after Danny Hylton cancelled out Lukas Jutkiewicz's 83rd minute strike. However, Jutkiewicz scored deep into injury time to deny the Shots and Young, who had made a string of saves to keep the Hampshire side in it. "It's all part of being a goalkeeper and I'm glad I could do my job and do it well," the Australian said. "I was quite busy but the team as a whole dug in and put hard work in. It just wasn't to be unfortunately. "When you get to 80-odd minutes and then concede two from there it is a bit gut-wrenching. "We acquitted ourselves really well and showed our team ethic and a strong mentality. We can all be proud of what we put in."